Bees buzz between the blue and white painted hives. There are light purple flowers growing in between the olive trees, rocks and brown grass. The sun burns. "Don't go any nearer, otherwise you'll disturb the bees' movement, and they may sting you," beekeeper Khairi Kharroubi warns. We are in the middle of the countryside in the Siliana province of Tunisia, a two-hour drive south west of capital Tunis. Khairi, 24, and two other beekeepers are proudly showing some visitors their hives. The three men are the first participants in a new social enterprise project called TuniBee, which is run by students at the Mediterranean School of Business (MSB) in Tunis. Under the scheme, people with beekeeping experience are selected from deprived areas of the country. Money from TuniBee's sponsors is then used to buy those taking part additional beehives. The beekeepers are also given training and guidance to produce better quality and larger amounts of honey. Each hive costs 200 Tunisian dinars ($91; £69), and in return sponsors get 1.5kg of honey a year for a period of three years. This is just over one-third of the current average annual production of a Tunisian hive, and 1.5kg of good quality Tunisian honey costs between 30 and 45 dinars. The beekeepers get to keep the remainder of the honey during the three years, and after that period, the hive, and all its future honey production, is theirs to keep. The idea for TuniBee came from Noomen Lahimer, professor of economics and entrepreneurship at the MSB, whose father keeps bees. Prof Lahimer proposed it to his students, suggesting that they should set up and run the scheme as part of their studies. "We immediately liked the idea," says MSB student Chaima Ben Romdhan, who is TuniBee's president. "However, we didn't have any specialist expertise [of beekeeping]." To bring in the required beekeeping knowledge, Prof Lahimer put his students in touch with a Tunisian entrepreneur called Khaled Bouchoucha. Mr Bouchoucha, who had previously been mentored by Prof Lahimer in a competition for start-up companies in 2013, runs a business that specialises in helping beekeepers increase honey production. His company, Iris Technology, has developed a beehive with a camera attached to monitor the movement of the bees. The hive is also fitted with a GPS tracker to try to deter theft - which is a growing problem in Tunisia. In addition, the hives are fitted with a monitor that measures temperatures and humidity. If anything goes wrong, the beekeepers are sent a text message so that they can react as quickly as possible. Mr Bouchoucha agreed to come on board and provide the beehives at cost price, and offer his company's technical support. He has been joined by Hidhli Naoufel, a veterinarian who specialises in bees. 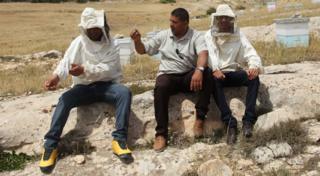 Mr Naoufel has been training the participating beekeepers in best practice. "Expertise is often lacking, and incorrect practices are adopted from generation to generation," says Mr Naoufel. One example of bad practice Mr Naofel is preventing is bees being fed sugar. This increases a hive's production, but results in a bland honey lacking the flavours you get if the bees are required to harvest various nectars. TuniBee currently has 24 sponsors, including parents and relatives of the students helping to run the scheme, and MSB staff. Recently some of the sponsors joined the students on a coach trip from Tunis to the village of Kesra, in Siliana province, to meet the first three TuniBee participants and see their hives. Mohamed Jouini, 32, says he was very pleased to have been chosen to take part. An electrician, he says he needs to keep bees to make extra money: "The current economic situation in Tunisia makes it hard to survive with just one job." Abdelfatteh Sayari, 38, has his TuniBee hives nearby. A mapmaker by trade, he started keeping bees as a hobby 10 years ago, keen to restart a family tradition. He says: "My grandmother kept bees in the traditional way - in trees - but nobody took over from her when she passed away." Fellow TuniBee participant Khairi Kharroubi has been helping his father look after bees since he was 12. He is currently doing a degree in business administration, so selling honey brings in vital money. One of the sponsors who travelled to Kesra to see the bees is Salwa Battikh. A retired English teacher, the 50-year-old is the aunt of one of the students helping to run TuniBee. She says: "I like the idea, it is something new and I hope it will succeed, because it is so hard to find good honey." Like many Tunisians she usually buys her honey direct from beekeepers in the hope of getting better quality for a lower price than that available in supermarkets. Ms Battikh adds that she hopes the scheme will encourage more people to go into beekeeping. Another sponsor, the MSB's vice dean, Leila Triki, is hopeful that TuniBee can help alleviate poverty in the Tunisian countryside. The intention is for the scheme to be expanded, including sponsoring a number of female beekeepers. TuniBee is also looking to bring on some corporate sponsors, with oil firms Total and Shell and computer giant Microsoft showing an interest. Export sales are also being explored, with the students from TuniBee having already found one US company interested in importing Tunisian honey. Currently Tunisia has 12,000 beekeepers who look after 256,000 hives, according to estimates by the Ministry of Agriculture. About 80% of those looking after bees do so to supplement their income from other work. The hope is that the beekeeping skills the TuniBee programme teaches will enable beekeepers to increase production. Presently the average amount of honey produced each year by a Tunisian hive is just 4kg, compared with 13.6kg in the UK and 34kg in Germany. Economist Mehdi Ben Braham of the University of Carthage in Tunis says TuniBee is an "interesting project". "This kind of project could have a significant socio-economic impact in deprived areas, by giving hope and creating sustainable jobs, and providing sufficient financial resources to reduce poverty."